NEW YORK—You know that your grass-fed beef is raised upstate, your heirloom produce are from a farm in New Jersey, but where does the salt in your meal come from? It is difficult to know—unless you buy it from your local rooftop salt farm. 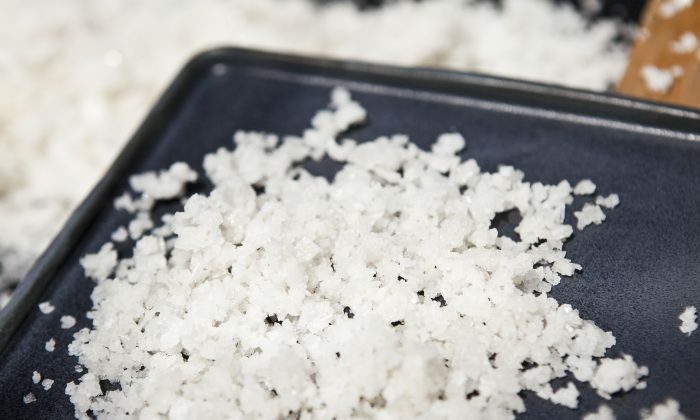 That’s right, there is a rooftop salt farm in Midtown Manhattan. Last October, Sarah Sproule, 26, founded Urban Sproule, a rooftop operation that consists of of three rolling boxes and a greenhouse that holds 500 evaporation trays. The farm produces roughly 30 pounds of certified kosher salt per month. Salt can come from the sea or from mining, in areas as far away as the Himalayan mountains. For socially conscious chefs and consumers, buying locally produced salt is the next step in food essentials. Every two weeks, Sproule picks up her salt water from Charlie Corriss, a fisherman for American Pride Seafood; he sells fish at the Greenmarket at Borough Hall. Corriss gathers the water for Sproule as he fishes in the Gulf Stream, 30 miles east of Montauk, Long Island. Sproule emphasized the importance of getting salt from the waters that are home to the freshest catch. Sproule uses 50 barrels. Her routine: she brings 25 empty barrels to Corriss, and takes the 25 other barrels she left with him the last time, which are now filled with 100 gallons of seawater. All that water “sloshes back into the city” in her car. Back on the roof, the seawater is dried via solar evaporation, which takes four to six weeks. Industrial salt is made speedily by heating the water. Although solar evaporation is a much slower process, it allows the natural minerals to remain intact—as well as the full taste of raw salt. The salt crystal sizes change with the season. It depends on how quickly the sea water evaporates, which relies on factors such as humidity, wind, sunlight, and heat. Spring and fall bring the most bountiful harvest. To Sproule’s dismay, spring weather only lasted a few days in New York City this year. In addition to raw salt crystals, Urban Sproule also sells infuses salt with flavors such as lemon verbena, celery, grilled ramps, and people’s general favorite—the Thai chilies. The Union Square Cafe currently uses Urban Sproule’s lemon verbena salt on their scallops. The lemon verbena is from a farm in upstate New York. A list of local farms where the ingredients came from are found on the back of their salt bottles. “I like lemon verbena on seafood because it adds the citrus flavor, and no one can grow citrus in this [cold] climate,” Sproule said. Celery salt tastes good with a Bloody Mary, she added. New York City restaurants such Northern Spy Food Company also cook with salt from Urban Sproule. The farm also sells at farmers markets in Brooklyn. Sproule is in the midst of working on new flavors, such as cheddar cheese salt, smoked salt, and thyme and lavender salt. Sproule has spent much time researching historical salt operations. For centuries, salt mining occurred in areas such as Syracuse and Cape Cod. She has the blueprints of the salt evaporation methods that were used from 200 years ago. “People say what I’m doing is so new, but people have actually been doing this for thousands of years,” she said. “The only thing new thing I’m doing is that it’s on a rooftop, and I only do it on a rooftop because I have nowhere else to go,” she joked. Sproule will be holding a salt tasting and cooking demo at Pescatore Seafood Company at the Grand Central Market on June 6 from 4:30 p.m. to 7 p.m.